Tablets are everywhere these days thanks to the iPad, but they lack a certain finesse necessary for fine digital arts work. That’s where longtime players like Wacom and Modbook still excel. Recently, I’ve had both a Wacom Cintiq 22HD and a new Modbook Pro in the studio for testing, and both have proven immensely handy for digital drawing, painting and photo editing. One’s clearly a desktop affair, while the other’s much more portable, but if you’ve only got the budget for one (it’s $2,000 for the Cintiq and around $3,200 for the Modbook), which to choose? The Modbook also retains most of the ports of the MacBook Pro, with one Ethernet, one Firewire 800, a Thunderbolt port and one USB 3.0, plus the SD and audio in/out ports. The other USB 3.0 on a standard MBP is used to power the Wacom digitizer built into the Modbook’s display, which offers 1024 levels of pressure sensitivity with the included stylus, which slides into a holster built right into the case. You also get a slot-loading Superdrive on the Modbook Pro, along with a power button and sync button, which you press to make sure the pen is properly calibrated with the display whenever you power it on. The display itself is a matte, 13.3-inch 1280 x 800 pixel LCD, which has a textured feel that resembles paper when drawing with the included stylus. The hardware is impressive, and feels sturdy and durable. Very sturdy, in fact, which accounts for one of its biggest drawbacks: it’s very, very heavy. At 5.4 pounds, it’s almost a pound heavier than a 13-inch MBP on its own, and since it’s a tablet designed for portability you quickly notice how hefty it actually is. Despite what you may think, it manages to not get too hot when in use, which is a huge bonus for a device that you’ll want to lie flat on your lap most of the time. 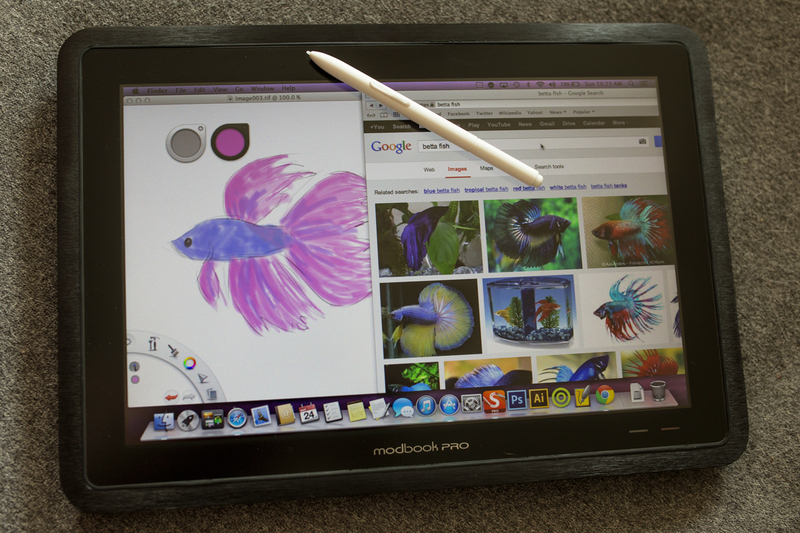 Weight issues aside, the Modbook Pro delivers as a drawing tablet. It feels very natural, and mimics the experience of paper well. With the caveat that you’re writing on that paper on top of a stone tablet from biblical times. But it meets the definition of portable, if only just, and gives you access to full Mac and Windows (through Boot Camp) programs, including Sketchbook Pro, Photoshop, Manga Studio and many other industry stand-bys. The problem is that you often want to use it on desks and other flat surfaces, and there’s no good way to change the angle. It meets the definition of portable, if only just, and gives you access to full Mac and Windows programs. Another issue is the on-screen keyboard. It’s the default one built into OS X, which many may not even know exists. It’s clunky, it only works with the stylus (no touchscreen input here), and it quickly has you diving for a Bluetooth keyboard if you’re doing anything other than opening and closing a drawing program. A good thing for comfort is that you can rotate the screen from the menu bar easily for portrait use. The Cintiq 22HD has two big differences from the Modbook, but in a way, they actually act as pretty equal trade-offs. The Modbook Pro costs a lot more, but that price difference is about the same as you’d pay for a MacBook Pro on its own, which is exactly what you’ll need to already own if you want the Cintiq 22HD to actually do anything, since it needs to plug into a computer. There’s also the portability factor: the Cintiq simply isn’t. It’s like any 20+ inch display, but slightly bigger on account of the adjustable angle stand and the built-in ExpressKey and touch strip controls. Plus it’s tethered to your computer via a DVI cable (and whatever adapter you require, perhaps to Thunderbolt or HDMI) and a USB cable that handles the pressure sensitivity duties. But, you can actually slide the Cintiq 22HD off its stand, should you want to lay it in your lap for comfort’s sake, though you’d better have a pretty wide and accommodating lap to use it this way. 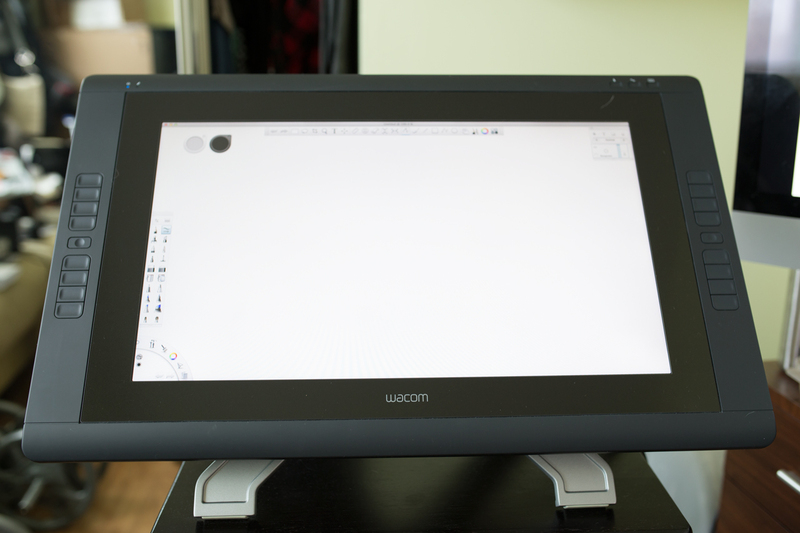 That said, the Cintiq 22HD is a dedicated drawing tablet and its dedication to that task shows. Despite the fact that both devices use the excellent Wacom pen tech, the 22HD has double the pressure sensitivity, so it picks up more subtle changes in pen pressure, ships with a much better and more comfortable drawing stylus, and has a better, brighter display that also hase a much better viewing angle. Like the Modbook, it supports display rotation, and on its handy swivel stand, is actually easier to manhandle when used on flat surfaces. the 22HD has double the pressure sensitivity, so it picks up more subtle changes in pen pressure. The Cintiq is also easier to use without a keyboard, thanks to the programmable ExpressKeys. You can assign them and the touch panels to zoom, pan, scroll, undo, delete, select all, or perform virtually any function you can do with a keystroke combination. That means a lot less cause to resort to keying in commands, which ultimately saves a lot of frustration. In some ways, comparing these two devices is like comparing an iMac to a MacBook Pro; if you need portability, you’re going to go with the latter regardless of the relative virtues of either. And the Modbook Pro is an excellent choice for demanding graphics professionals who need a portable device that has none of the trade-offs in terms of performance or software compatibility of something like an iPad or Galaxy Note 10.1. But if you fall within a broader group of pros and prosumers who are looking at either the entry-level Cintiq or the Modbook as a standalone solution, I’d have to go with the Cintiq. The Modbook’s portability is actually a hindrance in terms of making it comfortable for long-term use, and the Cintiq is just a better performer with more advanced, more nuanced tech on board for digital drawing and photo manipulation. Coming from the older Cintiq 12WX, the 22HD is a massive improvement, and that’s saying a lot considering how thrilled I was with the 12WX. The Modbook Pro is a remarkable achievement and perfect for those who demand portability, but it’s much more of a niche device. The Cintiq 22HD will disappoint no one who’s in the market for this sort of thing and has the budget to buy it. The main question that remains for that group of people is whether the just-announced 13HD can suit their needs instead, and I’ll let you know the answer to that in our upcoming review.